We love jerky--any kind of jerky. But we'd never heard of fruit jerky before. 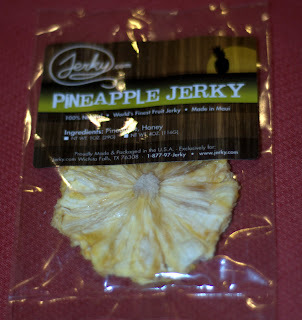 We recently tried a product called "pineapple jerky". We weren't sure what to expect since we've only ever had jerky that was derived from an animal, not a plant. Essentially, it turned out to be dried pineapple, but without all of the added sugar and crap you find in most commercial dried fruit. This pineapple jerky was more like the essence of pineapple, but without the mess of a fresh pineapple. It was nice and tart and not cloying at all. And delightfully chewy. It was pretty darn tasty. I'd eat it again. In fact, I demolished all the samples in about 5 minutes. Jerky.com also sells regular beef and turkey jerky. But what I really want to try next are their more interesting jerkys, like venison, elk, buffalo, ostrich and...wait for it...BACON jerky. Man, bacon jerky just sounds amazing.